← NVM/Funda, maak T.E.A.B. mogelijk! “De Donald Duck” is an institute in The Netherlands. The Disney comics magazine was first published in october 1952 and has been a huge hit under 10 year old boys (and their fathers) ever since. They celebrated their 60th anneversary last year. I buy one every once in a while for my boys, and last january I was confronted with a price increase from €2.20 to €2.40. I remembered that they had just increased the price from €2.00 to €2.20 recently, so I dug into the pile of old comic books at home to test my memory, and I was right! The Donald Duck had increased 20% in price in just 2 years. The Donald Duck Inflation Index was born. You can see the 1970’s in red where we suffered from “the Dutch Disease” (after we found a huge amount of natural gas our wellfare state was created) resulting in massive inflation. Recently a new inflation episode started for unknown reasons. 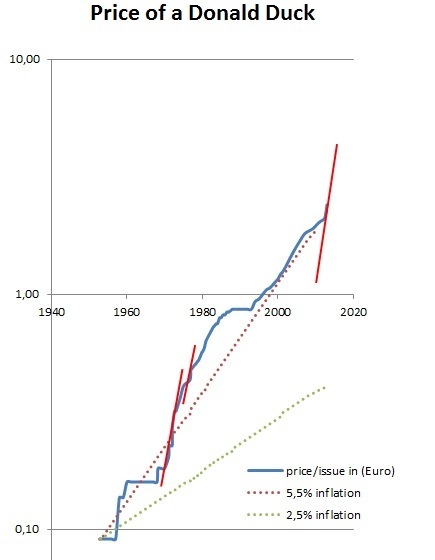 The official policy of 2.5% inflation is also shown in the graph. Although the DDII itself of is course not THE inflation (accept for the BIg Mac index, an inflation index usually consists of basket of products) I think it still is a very nice illustration of how consumers (10 year old boys with their pocket money) are confronted with huge price increases over the years, in case of the Donald Duck a stagering 5.5% every year, for 61 years. The first issue cost €0.09 (DFl. 0.20) todays issue cost €2.40 or 26 times as much. – the paper edition is still 300.000 (population 17 million), making it one of the largest magazines in The Netherlands, so dwindling reader numbers is not a direct cause for the price increases. – the number of advertisments per issue theough the years is something that I still need to investigate. The rest of my blog on ALT-economics is in dutch. Dit bericht werd geplaatst in Amerika, economie, Inflatie en getagged met 60-years, DonaldDuck, Inflation. Maak dit favoriet permalink.